Batman: Arkham City is a 2011 action-adventure game developed by Rocksteady Studios. 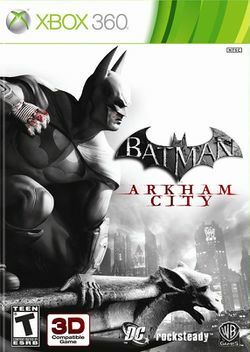 It is the sequel to the 2009 game Batman: Arkham Asylum, based on the DC Comics superhero Batman. The was released by Warner Bros. for the PlayStation 3, Xbox 360, Windows and OnLive. The game was officially announced during the 2009 Spike Video Game Awards and was released worldwide for consoles, beginning in North America on October 18, 2011, with the PC version scheduled for November. A Wii U version was released in November 2012 under the title "Batman Arkham City Armored Edition". The events of Arkham City take place one year after Arkham Asylum. Quincy Sharp, former warden of Arkham Asylum, has taken credit for stopping the Joker's Asylum takeover, and used the notoriety to become mayor of Gotham City. Deeming Arkham and Blackgate Penitentiary no longer suitable to contain the city's criminals and insane, Sharp has both facilities closed and buys out a large section of Gotham's slums, converting them into an immense open-air prison named Arkham City. The facility is placed in the care of genius psychiatrist Hugo Strange—who is secretly manipulating Sharp—and guarded by a squad of heavily-armed mercenaries hired from a rogue private military firm, Tyger Security. The inmates are given free rein as long as they do not attempt to escape. Batman maintains a vigil over the detention city, concerned that the chaotic situation there will get out of hand. Meanwhile, the Joker is stricken with a potentially fatal disease, mutated by his consumption of, and subsequent transformation by, the Titan formula—an unstable steroid serum which has the ability to turn men into maddened monsters. This page was last edited on 6 December 2016, at 13:27. This page has been accessed 28,430 times.